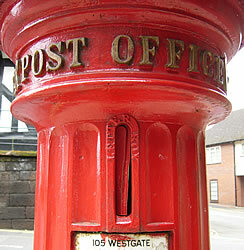 Warwick (pronounced "worrick") is located in Central England. It usually takes about 2 hours to reach here by coach from central London. You can spend time climbing the castle towers, walking through the gardens, visiting the exhibitions and watching special outdoor events. 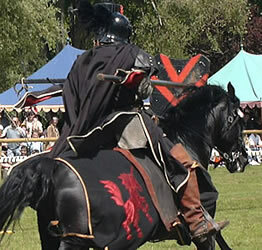 These events may include jousting, archery or falconry - check for details of the times and locations when you enter the castle. The gardens were created in 1753 by a famous garden designer called "Capability" Brown, who also created the gardens at Blenheim Palace. 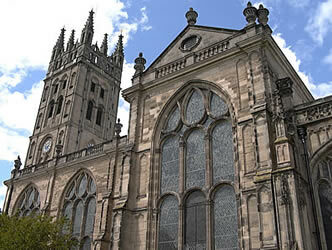 If you have time, a visit to the town centre of Warwick is recommended, to see St Mary's Church and other attractions. 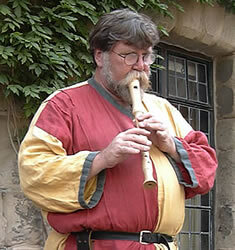 Musicians often perform near the entrance to the castle, playing traditional instruments such as pipes and lutes. 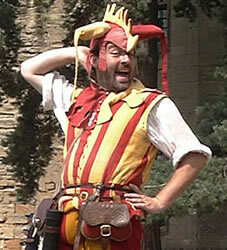 A jester is a traditional entertainer employed to make people laugh - you may see him as you walk around the grounds. 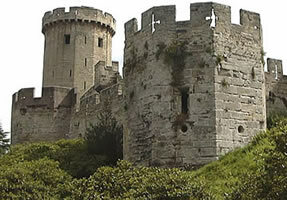 After the Norman king William the Conqueror invaded England in 1066 he started to build many castles. The original castle (fortified building) was constructed on top of a man-made hill called a motte (this is now called the Mound), which is where soldiers would retreat if attackers had got past the other defences. Around this a bailey was built: this is an area enclosed by a large wooden fence where people and animals would live in order to be safe from attackers or wild animals. 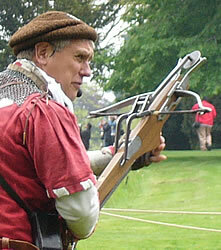 William created the title of Earl of Warwick for the person who he appointed to manage the castle. 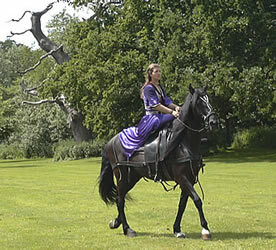 People and animals would enter the castle through the gatehouse. Behind this is a fortified area known as the barbican. Tall towers were built which had good views in all directions. 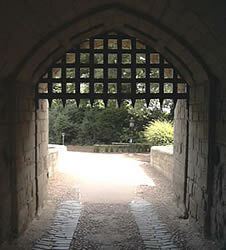 If enemy soldiers approached, a heavy wooden or iron gate called a portcullis was lowered to block the entrance. The original wooden walls were later replaced by stone. Most of the current castle was built between 1350 and 1400. A dungeon was built underneath Caesar's Tower to keep prisoners. 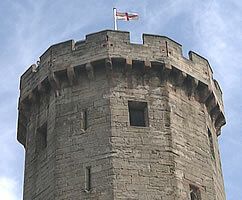 Guy's Tower was completed in 1395. The most powerful Earl of Warwick was Richard Neville, who helped to remove the kings Henry the Sixth and Edward the Fourth, and was therefore known as Kingmaker. In 1604 the king James the First gave the castle to Sir Fulke Greville, who was later killed by one of his servants: the tomb which he had prepared for himself can be seen in St Mary's Church. 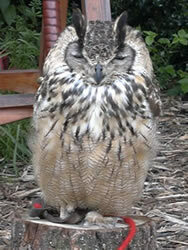 It is said that his ghost still haunts the tower in the castle where he lived. 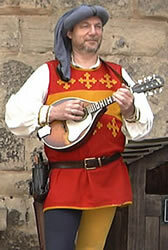 There are many attractions to visit inside Warwick Castle. At busy times you may need to queue to get into the most popular rooms. 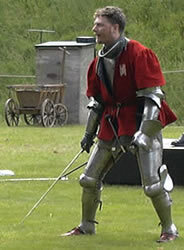 The building to the left of the gatehouse as you enter the castle is the Armoury, where there is an exhibition of weapons called Death or Glory. In the corner next to this is Caesar's Tower, including the dungeon in the lower floor, where prisoners would be kept in dark and miserable conditions and may have been tortured. 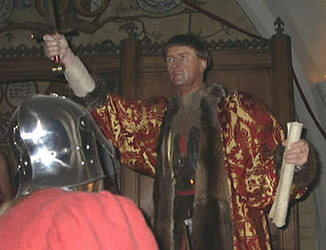 The Kingmaker exhibition tells the story of Richard Neville, the most powerful Earl of Warwick. The next building holds a display called the Royal Weekend Party - a reconstruction of a weekend party held here in 1898. 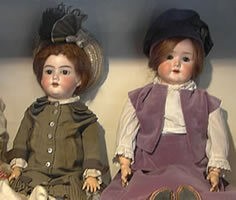 There are several living rooms and bedrooms, containing waxwork models of the people who attended. 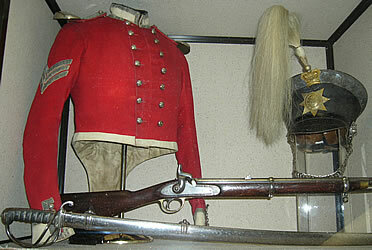 The State Rooms contain displays of the main possessions of the castle. 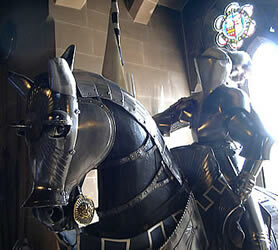 The Great Hall includes suits of armour from the medieval period. 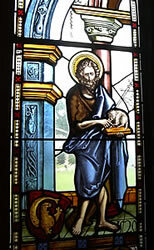 There is a small Chapel, including attractive stained glass windows. The dining room, drawing rooms and bedroom are beautifully decorated with antique funiture and paintings. The Ghost Tower is where Sir Fulke Greville lived and died, and is thought to be haunted by his spirit. 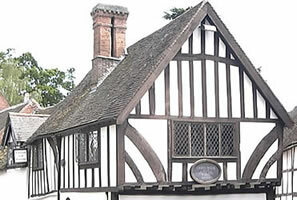 There is a Warwick Ghosts - Alive exhibition which tells the story of his death. There is an additional charge to visit this attraction. 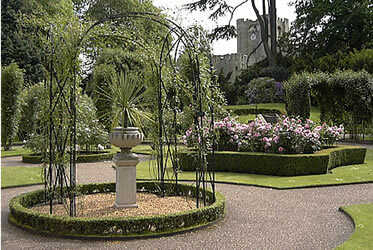 If you leave the castle through the gatehouse, you will see a short passage which leads to the Victorian Rose Garden. This was opened in 1986, based on the design of the original garden which was created here in 1868. 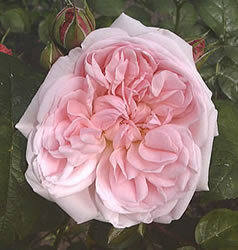 These rose gardens are most beautiful at the end of June and during July. 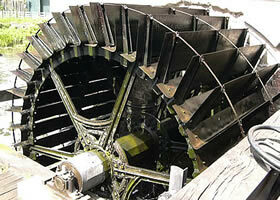 Walk outside the castle back towards the river and you can visit The Mill & Engine House (soon after Caesar's Tower). The waterwheel here was used to generate the castle's electrical power until it started to receive mains electricity in 1940. In the middle of the river (the River Avon) you can see the ruins of an old stone bridge. Walk along along the outside of the castle and cross the bridge onto River Island. During the summer, tents are put up on the island and there are special events during the afternoons. 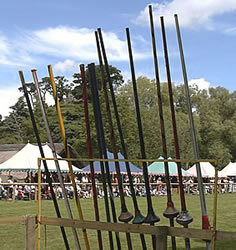 One of the special events which sometimes takes place at Warwick Castle is jousting. 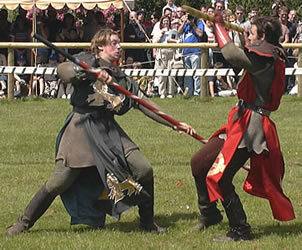 This sport was popular with knights in medieval times (more than 500 years ago). 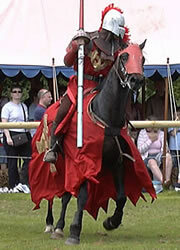 The soldiers would ride on a horse and fight with a long wooden pole called a lance. 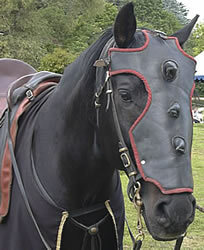 This demonstration is performed by a group known as the Devil's Horsemen, who have also appeared in many popular films. 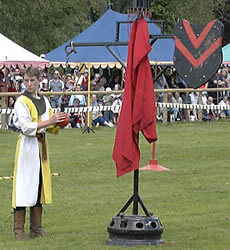 Each knight uses his lance to hit a target held by a page boy (a servant who is learning to become a knight). 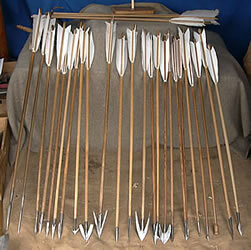 Before fights, ladies give favours to the knight: these are small tokens which he collects on his lance. 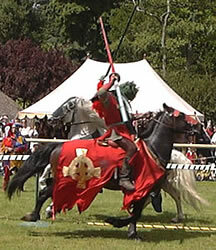 This inspires the knight during the battle. 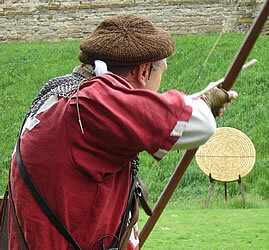 On some days you can see displays of archery by a bowman (archer). ... and by a young boy! 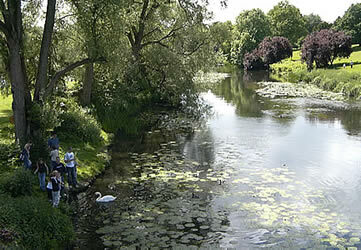 If you return back across the bridge and walk away from the river, you will reach the Peacock Garden. 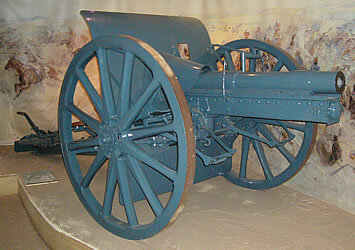 This was designed in Victorian times. 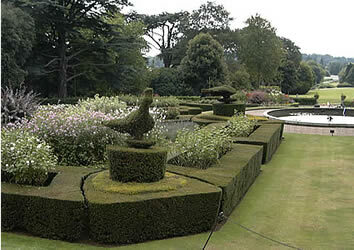 You can see some fine examples of topiary: hedges have been cut in the shape of peacocks. 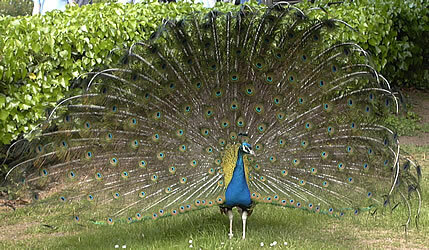 If you look around, you may find some real peacocks who may be keen to show off their beautiful feathers. 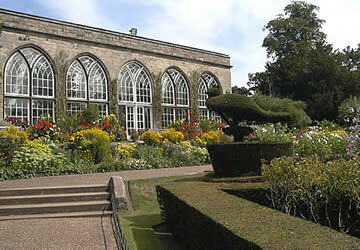 The conservatory was built in 1786. 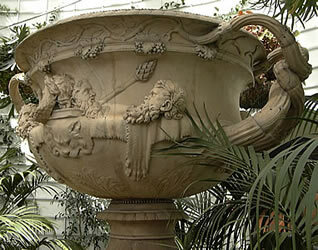 It houses exotic plants and a replica of the Warwick Vase, an ancient Roman vase which was excavated in 1771. The original vase is now in Glasgow. 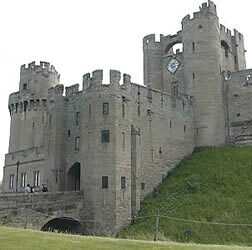 You will need to leave the castle to visit the town of Warwick. 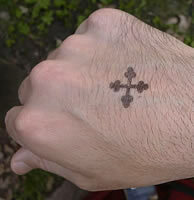 Ask one of the people at the entrance gate to stamp your hand if you want to be able to go back into the castle later that day (this mark will remain until the next day). 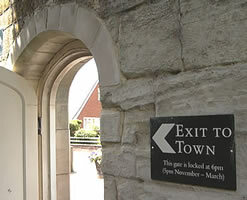 Go through the gate marked "exit to town" and you see Castle Street. 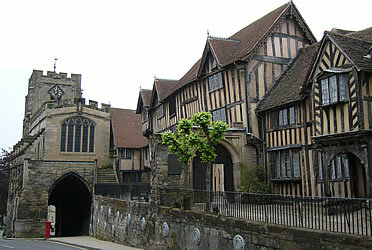 It is only a very short walk to the Doll Museum, St Mary's Church and other attractions (attractions not shown here include the medieval buildings of Lord Leycester Hospital and further museums: Warwickshire Yeomanry Museum, The Queen's Own Hussars Museum, Warwickshire Museum and St John's Museum). For details, visit the Tourist Information Centre in Jury Street. St Mary's Church (known formally as the Collegiate Church of St Mary) is located in Church Street, in the town centre. 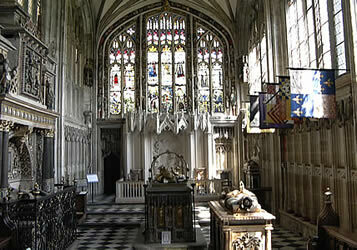 Many of the Earls of Warwick are buried here. The magnificent Beauchamp Chapel contains the medieval tomb of Richard Beauchamp (you can see this from a viewing area, but you are not allowed to go inside the chapel). You may want to try making a brass rubbing (you rub a crayon on a piece of paper on top of a metal plate, creating a copy of the design). Inside the crypt (created in 1123) you can see an original ducking stool (this was used to punish people who had done something wrong: they were dipped into a container full of water in public). 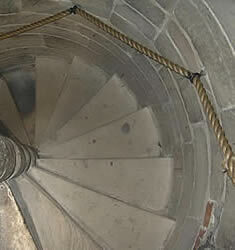 Climb the church tower for an attractive view of Warwick Castle. Ask about this as soon as you enter the church: you may need to wait for other people to come down the stairs. There is a small charge (£1.50 in 2004). 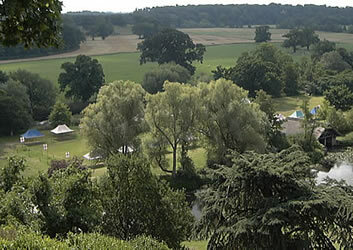 - To travel independently to Warwick by train from London, take a train from Marylebone station to Warwick station. 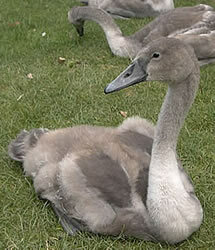 The journey takes about 1 hour 45 minutes: the station is about 15 minutes' walk from Warwick Castle. To buy a train ticket (from any starting station), see: Shop/Company/TheTrainline. 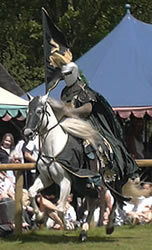 - There is also a limited National Express service to Warwick. The journey from London's Victoria Coach Station takes about 3 hours: the coach stops in Puckerings Lane, near the town centre. To buy a coach ticket (from any starting station), see: Shop/Company/NationalExpress.
" ... One of the most impressive castles in England ... the superb furnishings and sheer splendour of the interior are fascinating, and a walk around the ramparts rewards with panoramic views ... Even without the massive inducement of its fine castle, the sedate country town has other historic buildings and a general air of gentility to make it an attractive destination for a stopover"